So the Cubs are the Central Division Champs. Big deal. The city of Chicago is acting as if the Cubs have already won the World Series. I guess when you have a team like the Cubs, you have to celebrate every little victory because they are few and far between. Here's my prediction...the Cubs won't make it to the World Series. Sour grapes? Nope, just a reality check. The Cubs are going to choke and I'll be there, laughing all the way...hee hee hee! Wow. Last nights Cardinals/Astros game was one of the best ever. It didn't even matter that both teams are out of the running. It was soooooo exciting. The Cardinals scored 1 run in the second. The score remained 1-0 until the 7th when Houston scored 1 run. Then in the top of the 9th, Tony brought in Izzy (Jason Isringhausen) and Houston scored 2 runs (usual Izzy style....grrrrr). Well, the Cards came back to score 3 in the bottom of the 9th! Woohoo! Before the game, there was a ceremony for Mike Shannon celebrating his 50 years with the Cardinal organization. Among some of the special guests were Whitey Herzog, Lou Brock, Bob Gibson, Red Schoendeinst and Ozzie Smith. Stan "The Man" Musial sent his wishes via a taped video message. Anheuser Busch presented a check for $50,000 to the Mike and Judy Shannon Brain Tumor Research Fund. Judy Shannon passed away in July at the age of 66. We're going to the last Cardinal home game of the season tonight. The game was originally scheduled to start at 1:15pm but ESPN decided that they want to televise it so they changed the starting time to 7:00pm. I'm not sure why they want to televise it. I mean it's not like either team is in the running for a pennant...hee hee hee. Oh well. Anyway, it's Tony La Russa bobble-head day. I've seen a picture of it on TV and it looks really cute. Tony is wearing sunglasses (naturally) and there is a little kitty sitting by his feet. He loves animals and he founded the Animal Rescue Foundation (ARF) which is a no-kill shelter dedicated to bringing people and animals together. Isn't that sweet? OK, so let's hope the Cardinals can beat the stinkin' Astros today. Go Cards! I found an on-line grammar quiz. I got an A - 10 out of 10 right. Yeah me! You can click on the link below to try it for yourself. This time it's outside. Bill and I are both taking a vacation day tomorrow. We're having the carpets cleaned and then we're going to repaint the shutters on the house. We've been talking about doing it for a while so now is as good a time as any. We'll repaint the front door too but I guess that means I'll have to put Greta in the laundry room for a while until the paint dries and we can close the door. It's supposed to be 90 degrees tomorrow so we might have to wait until it's a little cooler. We'll, I'm leaving to go to my monthly Bunko group now. Keep your fingers crossed for good weather tomorrow. As I mentioned previously, I love the Big Flowers set as well as the coordinating Little Flowers set. I also love the new @Stampin' Up scallop punch. It seems to work perfectly with so many of my stamps. For this card, I chose Bordering Blue for the card base. I inked the polka dot image from Polka Dots & Petals with Close to Cocoa ink and stamped it repeatedly onto a small piece of Close to Cocoa card stock. I inked one of the flower images with Purely Pomegranate (I love, love, love this color), stamped it on Whisper White and punched it out with one of the 1 1/2" circle punch. I then punched a scallop circle out of So Saffron card stock and layered the stamped image on top. An Old Olive button was glue to the center of the flower. A small strip of Purely Pomegranate card stock was layered on the left side of the card and the flower image was then mounted with dimensionals at the point where the Purely Pomegranate and Close to Cocoa card stock meet. The sentiment is from Printworks and was inked with Not Quite Navy. All images (other than the sentiment), card stock, ink and accessories are @Stampin' Up. I received a Stampin' Up order yesterday. I just bought some card stock, buttons, jumbo wheel box and a Halloween set. The stamp set was on my list of things that I need (OK, things that I want) and it was 30% off if you spent $30. OK, that was no problem at all because I can always find something in the catalog that I need (OK, again, want). I already have another order waiting to be placed in October and more card designs are starting to swirl around in my head...hee hee hee. If you are considering buying a new TV, please read this post. We bought a Zenith LCD TV (model E44W46LCD) three years ago. The TV hadn't been on the market very long (first mistake) and after only 11 months, a green haze started appearing at the bottom of the screen. Well, apparently the "light engine" failed. OK, so it was still under warranty but if it hadn't been, it would have cost $1500 to repair. WHAT? Considering the price of the TV was $2,000, that is just ridiculous. I started doing research on the Internet and found that this was a major problem that many consumers were experiencing. When we had the TV repaired, I asked the service technician what assurance I had that this wouldn't happen again. I was told that it could happen again and that the replacement part is not under any kind of warranty. Fast forward not quite two years...we're having the same problem again only this time it's a blue haze instead of green. I started researching it on the internet again and, lo and behold, there are even more posts regarding people who are having this same problem. Get this, repair shops are having a hard time getting the replacement part because Zenith is no longer making this TV or the parts! It is now out of production and the last ship date was January 2007. We purchased the TV from Best Buy and they stopped carrying it two years ago. There are several class action suits currently in process. I called Zenith (which is now LG Electronics) today. The customer service rep listened to my complaint, took my information and said that he would forward it to another department and someone would contact me within 3 to 5 days. We'll see what happens. I can tell you this for sure, if they don't resolve this problem to my satisfaction, this will be the last Zenith product I purchase EVER! I've participated in quite a few Artist Trading Card (ATC) swaps lately. I love making them and the possibilities are truly endless. The only requirement for all ATC's is that they measure 2.5" x 3.5". Each individual swap hostess then outlines further requirements (i.e. specific stamps, themes, embellishments, etc.). This particular swap required that we use at least one Amuse stamp. 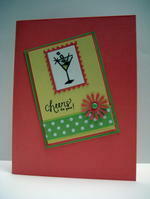 I decided to use the martini glass image and the "cheers to you" sentiment. I chose Certainly Celery as for the base and then added Cameo Coral for the next layer and Barely Banana for the top layer. I attached a piece of May Arts polka dot celery grosgrain ribbon at the bottom. One of the flowers from the @Stampin' Up Spring Flower Bouquet punch was punched on Cameo Coral and the flower was secured with a Certainly Celery brad. 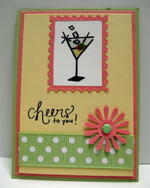 I used the Cuttlebug postage stamp die to create the border around the martini glass. A small olive was created by punching a 1/8" circle in Old Olive and a 1/16" circle in Real Red. Crystal effects was applied to make the glass look like, what else, a glass. Sometimes when you participate in a swap, someone drops out of the group and you end up getting one of your own ATC's back. I always make an extra one to keep for myself so when I started getting a few of mine back, I just put them on my stamping shelf. I sent a few to a fellow stamper who was making an ATC album as a get well gift for her mom. 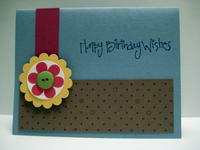 Another fellow stamper then mentioned that she incorporates her extra ATC's into a card creation. How cool is that and why didn't I think of it? Well, I decided to try it with this ATC. I simply mounted the ATC on the card base and viola...instant card. I thought about stamping a background but I didn't want to detract from the focal image. All card stock and ink are @Stampin' Up. We went to the Cards/Cubs game today and the Cards lost. Phewy! I haven't officially given up on the Cards but it sure doesn't look good. Maybe it's time to start hoping that the Brewers beat the stupid Cubbies...hee hee hee. It always seems like it takes me a week or so to get back into my regular routine after returning from vacation. I just realized that I haven't posted anything new here since September 4. Good golly! OK, now that you've been waiting so patiently, here is one of my latest creations. I started with Purely Pomegranate for the base and then layered a slightly smaller piece of white and a even slightly smaller piece of Wild Wasabi card stock on top. I embossed a piece of Blue Bayou card stock using the Cuttlebug hearts embossing folder and mounted it on the lower right side of the card. I added a small strip of Pomegranate card stock at the bottom. "Forever" from "So Many Sayings" was stamped and cut with the Stampin' Up Word Window punch. Two small circles were punched from Wild Wasabi card stock and added to the punched image. For the main focus, I used the heart image from "A Light Heart." I stamped it on white in Purely Pomegranate ink, cut it out and created a metal rimmed tag using the Making Memories tag maker that I bought at Michael's a few months ago. I punched a small hole and added silver cord tied in a bow. I cut a scallop circle with the Marvy Uchida mega scalloped circle punch and mounted the tag on top. Photo corners were created with the new Stampin' Up photo corner punch and white eyelets mounted in opposite corners completed the design. All images, card stock, and ink are @Stampin' Up. Woohoo! Check out page 139 of the Autumn issue of Take Ten. The card with the heart is mine. I've been published! I'm an official card artist...hee hee hee. I submitted 4 different cards and crossed my fingers that maybe one would be published. I had been told by several seasoned stampers that it may take many submissions before one of my creations was published. I honestly believed that my first, second, third and probably fourth attempts would be turned down but I knew that I would keep on trying. You can't imagine how happy I am to have one of my first submissions published. I'm not sure if I can post a picture of the card. For now, I'll just say that it's a different version of this card which I created about a year ago. I changed a few things and submitted the new creation. This was definitely my favorite of the four cards I submitted so I'm even more glad that this was the card that was chosen.